1) Some Fossils Have Asbestos In Them! Just don't put that thing in your mouth, Gould. First off, asbestos is really only dangerous if you inhale the dust. Of course, considering that it's been used as insulation in the US since 1866 in crumbling, decrepit buildings that often house natural history collections, it's been largely inevitable for a long time that paleontologists would come in contact with. However, we're not talking about how some asbestos houses fossils: some fossils are made with asbestos. Or in rocks that have asbestos. And naturally, since the only way to get a fossil out of a rock is to grind away at it and send dust flying, paleontologists have to take extra precautions when working with asbestos-laden fossils. As a side-note, Steven Jay Gould was diagnosed in July 1982 with peritoneal mesothelioma, a deadly form of cancer affecting the lining of the abdomen and frequently found in people who have been exposed to asbestos or rock dust. After an experimental treatment of radiation, chemotherapy, and surgery, Gould made a full recovery. No idea whether he was engaged in enough asbestos-laden fossil preparation for that to be the cause. 2) And Some Fossils are Radioactive! Fossils are found in the ground. So is uranium. Sometimes they get together and have really poopy parties that people aren't really keen to be invited to. So how do these fossils become infused with death? While the bones are underground and being reworked by precipitated minerals they are vulnerable to invasive elements. The cavities within the mineral lattice of calcium phosphate are hot spots for uranium atoms and it literally becomes incorporated into the calcium phosphate lattice during diagenesis. Many dinosaur discoveries are aided by the use of a geiger counter (detects radiation). 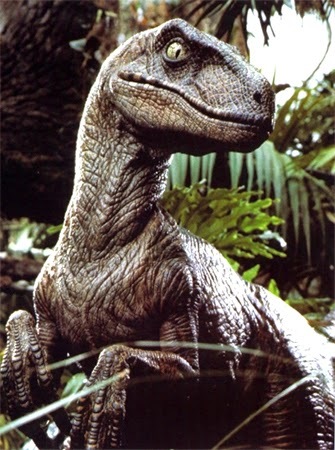 The dinosaur bones have a much higher level of radioactivity than the surrounding matrix because the soil and rock collect and accumulate far less uranium and allow the atoms pass through at a higher rate. Thus, radiation detectors can be a great aid for discovery of highly mineralized bones! Then what happens with all these radioactive bones in museum collections and on display? Oh, they were just coated in lead paint. Problem solved, right? 3) Some fossils are found on unstable surfaces! Fossils are found in rocks (hopefully you knew that already). Rocks that produce fossils tend to be exposed. Exposed rocks experience more weathering, and are more prone to failure. So fossils are frequently found in outcrops that are subject to mass wasting events. Last fall, October 2013, a huge landslide occurred on the Denali Park Road around mile 35, literally less than half a mile from where Amy did the majority of her paleontology surveying throughout the season. Amy was looking for fossils in the lower Cantwell Formation, the landslide happened in the upper Cantwell Fm, which is what we like to call a close call in the paleo world. Luckily no one was around when the slope failed and Amy was invited to join the park geologist to survey the damages with expensive GPS equipment. Later, Amy was even more stoked to discover pictures of herself in the news articles about the slide. Sometimes people and animals are just too eager to find fossils, and manage to surround themselves in rock instead. 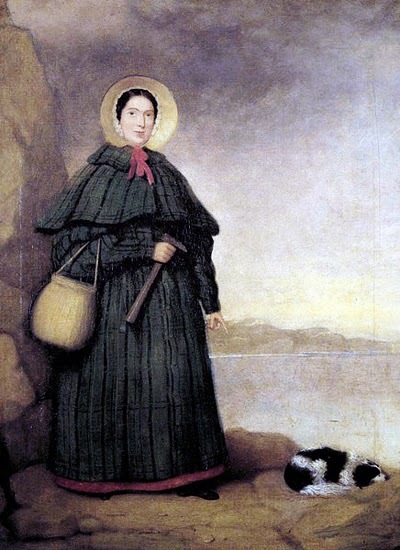 Our namesake and patron saint Mary Anning learned the hard way how dangerous landslides really can be. In October of 1833 she barely avoided being crushed by a landslide that occurred on the steep cliffs surrounding Lyme Regis. Though she narrowly escaped, the landslide buried her dog, a black and white terrier named Tray who was her constant companion. She wrote to a friend, Charlotte Murchison, in November that year: "Perhaps you will laugh when I say that the death of my old faithful dog has quite upset me, the cliff that fell upon him and killed him in a moment before my eyes, and close to my feet ... it was but a moment between me and the same fate." Besides uranium and asbestos, plain-old boring sandstone can also be an unsuspecting killer. After a fossil comes out of the field it has to be prepared from the enclosing rock. Frequently fossils are found in sandstone, sometimes even super well cemented sandstone that requires power tools to get any matrix off the specimen. These tools produce lots of dust rich in silica. Seems innocent enough, but after a while can produce an effect known as stone lung. Nobody wants that. Though it would be awesome if gooey bits like lungs really could be turned to stone... that's not what stone lung aka silicosis actually is. Symptoms of silicosis include shortness of breath, cough, fever and cyanosis (bluish skin, papa smurf style). Your lungs are literally being scarred by the tiny flakes of crystalline silica, causing inflammation and nodule lesions in the upper lobes of the lungs. Bummer dude. 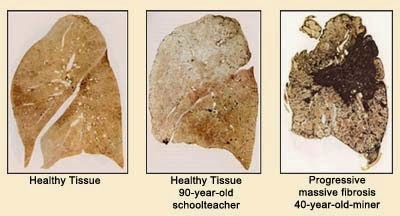 Always have proper ventilation, your lungs will thank you. Like this post? Well we're too lazy/busy (PhDs and all) to do daily fully-formed posts, but we're pretty active on Facebook or Twitter, or Instagram! We also once found out we have a Google + account, if you prefer the red-headed step-child of social media. Leiggi, Patrick, and Peter May, eds. Vertebrate paleontological techniques. Vol. 1. Cambridge University Press, 2005.